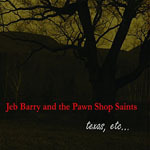 Share the post "Album review: JEB BARRY AND THE PAWN SHOP SAINTS – texas, etc…"
Upbeat isn’t a word you ‘d associate with this gritty, lo-fi debut release from Jeb Berry And The Pawn Shop Saints – a sparse acoustic-based set focusing on the darker side of life from the Berkshire Hills of New England. But there’s something beguiling about the understated delivery that, with repeated plays, works its way below the skin and – before you know it – begins to feel like an old friend. Spread over two discs – The Sainted, and The Saintless (although the generous 19 songs would have fitted, with room to spare, on a single disc) represent a split between full band arrangements and sparse, mostly solo songs. Although, frankly, not even the ‘rough and tumble’ acoustic driven ‘hard-dirt Americana” of the ‘full band’ The Sainted is exactly sonically over-populated. And that’s the attraction of this low key, minimalist, release. Every word, every note, every whisper, is exposed. And to stand that level of scrutiny unscathed requires some substance. So when Jeb whispers that he ‘woke up in a ditch, alone’ – you’re there, hungover, but inexplicably filled with hope. This entry was posted in ALBUM REVIEWS, ALBUM REVIEWS (Mobile), All Posts and tagged album, Americana, etc..., Jeb Barry And The Pawn Shop Saints, review, roots, singer, songwriter, Texas. Bookmark the permalink.